Home» Ahmet Ertegun » What Do You Think About the Piano? Today’s post ties together several of my earlier posts, which is always a goal of The Adios Lounge. “Everything’s connected,” as we were reminded last week in The Roots of Keith Richards. Two months ago, Jay Farrar & 8-Track Heavana featured The Rolling Stones and “Wild Horses,” with appearances by Jim Dickinson, Gram Parsons, and Altamont Speedway. Four years ago, Just as Long as the Guitar Plays addressed the relationship of Keef and Gram, as well as the influence of country music on the Stones and post-GP Burrito Brothers. Almost five years ago, I wrote RIP Les Paul & Jim Dickinson and The World According to Memphis, both quick drive-bys of the Dickinson world boogie. Finally, Jerry Wexler is referenced a few times in the videos below and RIP Jerry Wexler is a pretty good overview of his legendary career. It’s anything but a “fun” fact, but Wex and Dickinson died exactly one year apart. Jerry passed away on August 15, 2008, and Jim died on August 15, 2009. This interview is a wonderfully engaging reminiscence of the Stones’ time in Muscle Shoals (December 2-5, 1969). 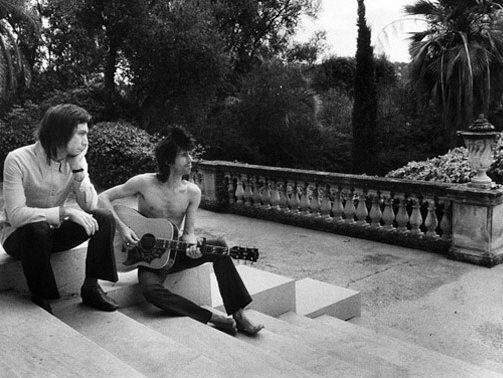 They cut three songs, all of which ended up on Sticky Fingers, the last with the improbable assistance of Dickinson. Here’s his hilarious, grateful, and detailed account of those few days in Muscle Shoals, rendered in two equally compelling parts. Below each video is an annotated transcription of Dickinson’s remarks. I’ve made small edits in a few cases, usually denoted by a . It was December 1969 and I just made the deal with Wexler to take the Memphis-based rhythm section [The Dixie Flyers] to Miami. We were gonna begin working for Atlantic in January. 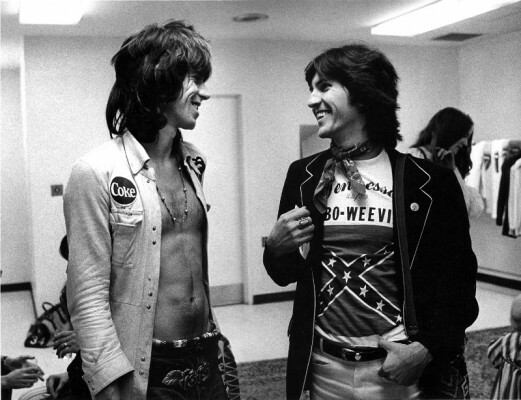 Our friend Stanley Booth [like Gram Parsons, from Waycross, Georgia] was on the road with the Stones working on their authorized biography [The True Adventures Of The Rolling Stones]. Stanley had put together, basically, my deal with Atlantic [because] he and Wexler were good friends. I’m at home back in Memphis waiting to go to Miami. Phone rings in the middle of the night, it’s Stanley. And he says, “The Stones have got three days at the end of their tour and they want to record because they’re tight, they’ve been touring together. Could they record in Memphis?” At the time, through the American Musician’s Union (he probably means the American Federation of Musicians), a [foreign] artist could get either a touring permit or a recording permit, they couldn’t get both. The Stones, of course, had a touring permit. They had been prevented from recording, during this period of time, in Los Angeles. Leon Russell was fined by the union, I think, for trying to put it together. So, they were looking for a place they could record under the radar. The Dixie Flyers: Jerry Wexler in middle, Jim Dickinson far right. I said, “Safety.” At the time, I really didn’t think there was any studio where they could’ve recorded without somebody knowing who they were and what they were doing. Stax had just turned down The Beatles, which was an insurance problem as I understand it. And automatically I said, “Muscle Shoals. Nobody will even know who they are,” and, in fact, nobody did. They stayed at the Holiday Inn. I said, “Call Wexler,” because Atlantic was working in Muscle Shoals exclusively at that point. I pull up in the parking lot at the old Muscle Shoals Sound Studio out on the highway [3614 Jackson Highway, as Cher said]. I like to say it was a coffin factory. David Hood [FAME bassist/father of Patterson] corrects me and says it was really only the warehouse where they stored the coffins. It’s across the street from the old graveyard, [a] small, little building. Keith/they had just met Gram Parsons* and he kind of introduced them to country music. So, as luck would have it, through Stanley and whatever, Keith and I sat down at the piano and started doing country songs. We’re just kinda jamming and then here comes Jagger and all the rest of them. Anyway, I managed to weasel my way in to where I was — no matter what you hear — the only outside person there [besides] Stanley and Tony, their bagman. Not Spanish Tony who wrote the book, but a black guy from Detroit who was carrying the dope. Nobody else. * This is half-true. Gram introduced Keith and Mick to a lot of country music, but they didn’t JUST meet. Parsons and Richards actually met at a benefit concert at Royal Albert Hall in London on July 7, 1968 (“Sounds ’68”), where The Byrds played just prior to their ill-fated South Africa tour. Gram (in)famously quit after that show, no doubt on some level out of opposition to apartheid, but more than likely because he got to hang with Keef, with whom he ended up staying for a few weeks. Ahmet Ertegun was starting a session the next day with R.B. Greaves [just coming off a #2 hit with “Take A Message, Maria”]. And believe me, Ahmet knew their contract was running out. I met Ahmet in the room with The Rolling Stones and was equally impressed. He was taking up as much room as Mick Jagger was, let’s put it that way. You could tell every hair on his beard was exactly the same length. This is a cool guy, doing business right away. 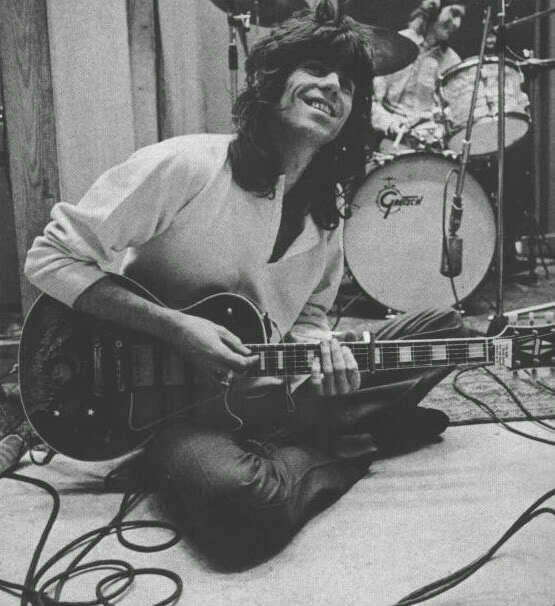 The first night they cut “You Gotta Move,” which they’d been doing in the live show as a duet, with just acoustic guitar [Keith] and Jagger. So, they’re doing it with the whole band. Stanley and I are in the control room and they’re starting to run this thing down, and it just ain’t working. I mean, it was terrible. We [Dickinson and Booth] are gone maybe 45 minutes, an hour tops. And what we left was chaos for the Stones. We come back and they’re listening to the first playback and they had managed to turn this chaos into what was a classic Stones performance … in a matter of 45 minutes. I’ve seen some pretty serious songwriters in my day. I’ve never seen anything like what Mick Jagger did. Second night they come in to work on “Brown Sugar.” Keith has got the music for the song, the killer riff, but no words, no title, no nothing. Jagger has a green steno pad. Keith is, as he plays the song, he’s singing what isn’t words, this guttural sound. Jagger’s writing it down like he’s translating, like he’s taking dictation. After he has enough he kinda wanders off and scribbles away. When he gets three pages full of lyrics, which took him less than an hour, that was the song. I’ve seen some pretty serious songwriters in my day. I’ve never seen anything like what Mick Jagger did. I watched ’em cut “Brown Sugar” and it was brilliant. There’s an 8th note tom tom ride at the beginning of every verse. And Charlie [Watts] walked in, he didn’t even have a pair of sticks. He just walked in, picked up the sticks that were there, and sat down and started playing the drums. So, he’s doing this tom tom ride and it’s rubbing against the bass note that’s there. I experienced a little success as an R&B session player. And what we did was the same thing everyday. Insert the artist. Hamburger production. Assembly line. Lines, patterns, forms … insert the artist. Play it til it’s right. I’ve been on cut #132 with Aretha Franklin and you play it til it’s right. No ProTools. That’s what I was learning, that was the way I thought you made a record. And here’s The Rolling Stones. They literally take the first cut that they get through without a major mistake. Nobody says the words, “Should we do that again? Can we do that better? Why don’t you do this, why don’t you do that?” Those words were not spoken for three days. When they got through a cut without a major mistake, Charlie Watts got up from the drums and, by God, it was over. And I’m sitting there thinking, “Well, this is certainly not the way we make records, who do you suppose is right here?” And I think maybe it’s THEM! The third night, of course, was literally the major beginning of my career, and that was “Wild Horses.” Keith had a little more of the song. He had the whole chorus and some kind of mumbling words. It was a lullaby, as he initially wrote it, to Marlon, his first son who had just been born [August 10, 1969, exactly one week after me]. He didn’t wanna go on the road, that’s what the song was about. Jagger rewrote it, took a little longer than he did with “Brown Sugar.” But, the same kinda thing, it was just amazing to watch his mind and his hand write it as fast as he could. And he changed the song. It’s about Marianne Faithfull and whatever, I don’t wanna get into that. 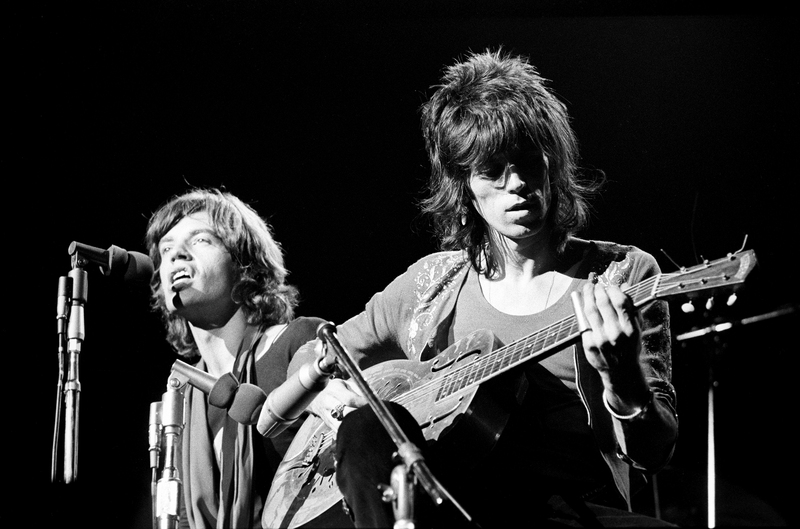 But, as they start running the song down, they way they actually worked, was Jagger would stand on the floor with a handheld microphone — of course, everybody’s wearing earphones — and run the song down to the band, until the band got the chord progression and the arrangement. Then, he would go into the control room with Jimmy Johnson and work on the individual instrument sounds. Very business-like. And the band would play the song instrumentally, which was a big help. So, I start trying to play. First I get the chords from Keith and he’s drastically out of tune. I sit down at the concert grand piano and played a couple of chords and realized (laughs), “This is never gonna work.” And you can’t go, “Hey Keith, baby! E, this is E. Let’s tune it up, pal!” That’s not gonna work. I thought, “Well, maybe the Wurlitzer.” Sometimes you can kinda cheat the wurlitzer and get it to crack. Nope, the wurlitzer is not gonna work. So, I go back to the tack piano and start plinking around and Tony [the bagman] wakes up and moves the dope, which was a nice vignette in the whole story (laughs). But, I find an octave-and-a-half of this piano that’s out of tune enough to fit with Keith Richards. It’s really simple because of the dead strings there’s no harmonics, no overtones. He says, “Oh, pay no attention to him, he has no idea what he’s doing.” And then he said, which to me has become an immortal line, I’ve quoted it over and over. He says, “He only knows where he put his fingers yesterday!” Which is a perfect definition of rock ‘n’ roll guitar playing. Keith thought he had learned to make a Nashville chord chart, which is in numbers, rather than symbols (the Nashville number system invented by The Jordanaires a decade earlier). What he had done, the song’s in G, but begins in B minor. And he had called B minor “1.” So, the whole chart was up a minor third, which is harmonically kinda interesting, but not what you’d call right (laughs). The Stones to this day think I’m a country piano player. I knew TWO country licks. Two Floyd Cramer licks I learned in school in Texas (Baylor University) and I’d basically learned them because I thought they were funny. I had some stuff that I did on country sessions for Stan Kessler, but it wasn’t really (country) playing. But, that’s what [the Stones] wanted, so I’m back there and I’m hitting my little Floyd Cramer lick (laughs). All right. So I played my OTHER Floyd Cramer lick, which turned into what they called “the solo.” Believe me, I was not trying to play a solo, I was trying to get to the next stinking chord because I knew nobody else knew what it was! The Maysles brothers, the documentary filmmakers, showed up the third night. They’d already shot the Stones in New York. They were gonna follow the Stones to Altamont which was the next day. They left Muscle Shoals and flew into Altamont (San Francisco, actually). I have never been sorry I didn’t make the trip. I might as well tell all the Stones stories. Two other stories before I finish that one. A) My footnote to rock ‘n’ roll history. That third night, after we had the track for “Wild Horses,” they went back and redid the vocals. And the way they did the vocals was Mick and Keith in the vocal booth, on the same microphone, passing a fifth of bourbon back and forth. Harmony vocals and the same track as the lead vocal. Nobody’s gonna tell ’em not to do it. He said, “Oh yeah, that’s right.” Then he says, “Who said that? Is that Booth?” meaning Stanley. Jagger says, “Same thing” (everybody laughs). After they get the vocals, they’re doing rough mixes. It’s dawn by now on the third night (December 5th) things are pretty relaxed. I see the Maysles setting up these lights for this shot. Well, I went to drama school (Dickinson graduated from Baylor with a drama degree), I know what the lights are about. (The lights) are aimed right at the couch and as luck would have it, I had the last joint. So, I put it behind my ear and I sat down on the couch. And before you know it, here comes Keith. He sits down beside me on the couch, they play back “Wild Horses,” they turn on the lights, and I’m in the movie. It was a year-and-a-half, two years later before I saw the final cut and realized that I had made it. I look like I’m there to change the tires, but I am, nonetheless, in the movie (laughs). And it did absolutely jumpstart my career, what I laughingly refer to as my career. So that’s the whole reason for my career. (Ian Stewart) didn’t wanna play that B minor, God bless him.